This week on The Revolution with Jim and Trav it's Adventure Reload, as the boys talk firearms, ammunition, concealed carry and an amazing expedition. Joining Jim and Trav will be Don Mann, contestant on “The Brigade” on Outdoor Channel and Eric Rice, Sticky Holsters Operations and Sales Manager. Plus, Derrick Ratliff, President and Founder of Horizon Firearms. Jim and Trav’s Adventure Reload is presented by Outdoor Channel, Sportsman Channel, World Fishing Network and MyOutdoorTV! Have you ever hunted outside of the U.S.? Many hunters overestimate what kind of caliber they will need to hunt in Africa, often thinking that the Dark Continent requires a canon regardless of what game they are pursuing. However, more isn’t necessarily better. Derrick Ratliff, president and founder of Horizon Firearms, joins The Revolution this week to talk hunting abroad, how to decide what is enough gun for the exotic species you’ll be pursuing, realistic calibers for dangerous game, traveling with firearms and ammunition, being properly prepared with the gear you need before leaving the U.S. and so much more. 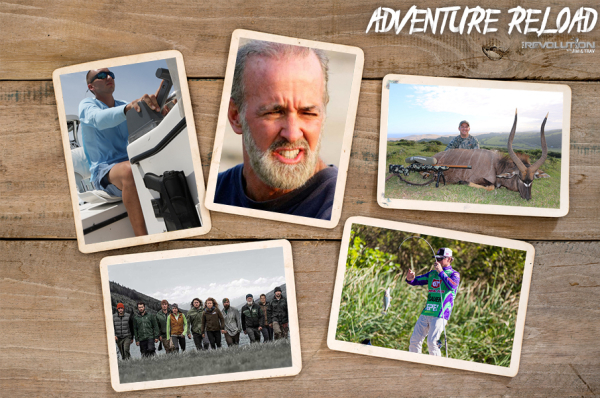 Some serious adventure is about to hit Outdoor Channel! “The Brigade – Race to the Hudson” is an all-new show, premiering April 22 at 8:00 pm ET, where 10 contestants have 28 days to travel 750 miles across the York Factory Express. Are you intrigued yet, I know we are! The 10-member team has to push themselves to the extreme, together, to conquer this grueling cross-country wilderness expedition. If they succeed, a $500,000 grand prize will await them. This 750-mile journey follows the York Factory Express, an historic fur trade route and they’ll be doing it the same way the old timers did – on foot and in boats. No fuel, no GPS, all they have is their collective skill set to survive, navigate and hopefully get across the finish line. This is an adventure of a lifetime and Don Mann, contestant on “The Brigade”, will join us to talk about it. Gary Klein is a professional bass angler and founder of “Major League Fishing” that airs Saturdays at 2:00 pm ET on Outdoor Channel. Gary joins The Revolution this week to talk all things bass fishing and Major League Fishing so listen in! Stage 3 of the Major League Fishing Bass Pro Tour in North Carolina just wrapped up this past weekend and Gary recaps the action with Jim and Trav. Plus he’ll talk about the way Major League Fishing is revolutionizing the bass fishing world and how in-depth coverage with easy access for viewers is bringing a wide new audience to the sport.